I always hated when this guy met Chansey and Scoop Up. Oh god why. I didn’t mind so much that the damage was leaving play. What annoyed me against that deck was that damn Mr Mime. 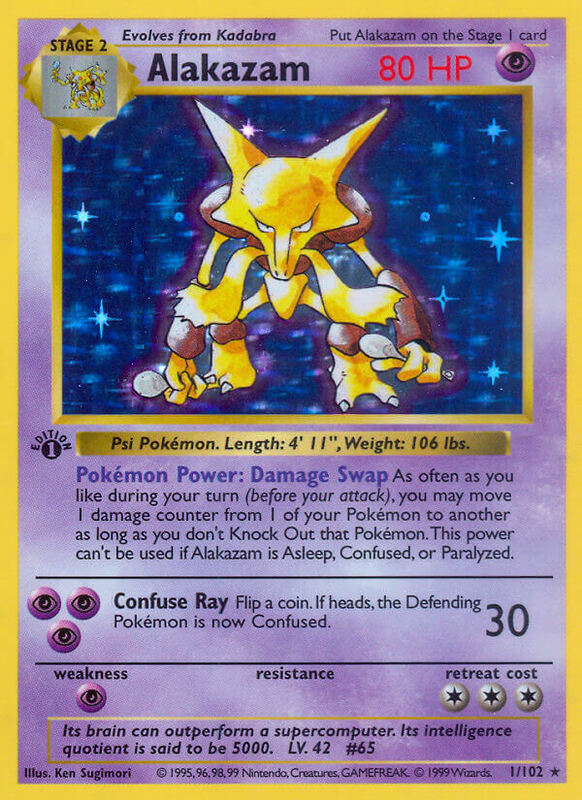 I always found it interesting that all of the early Psychic types were weak to psychic in the TCG since the beginning, even though in Gen 1, bug was psychic’s only weakness, which has always been represented by grass in the TCG. It makes since today, sense Ghost is one of psychic’s weaknesses and the ghost type is psychic in the TCG. Actually, wasn’t Psychic weak to Psychic in Gen 1? No, it wasnt. Psychic was only weak to bug since ghost didnt even affect them. This was a bit messed up, I think they early knew about those changes in gen 2 refering to ghost type. ‘Psychic-type Pokémon had virtually no match because their moves were resisted only by other Psychic types and their only weakness was to the Bug type, of which there were only three damaging moves: Leech Life, Pin Missile, and Twineedle. Additionally, most of the Pokémon that learned these moves were part Poison and therefore weak to Psychic moves. Ghost-type moves were also completely ineffective against Psychic types instead of being super-effective, due to what may be a programming bug’. So yeah, Psychic types were only weak to bug. It’s kind of weird.